S M Ong: Hey, so do you make $7,000 a month? I bumped into my neighbour as I was getting out of the lift today. 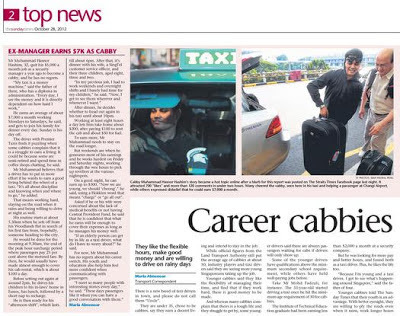 Since he's a taxi driver, I wanted to ask him - as a joke - if he actually makes $7,000 a month. But then I stopped myself because I thought it would be rude. Yes, I actually care about not being rude. He's an older guy, so maybe he's not on social media and isn't aware of all the online discussion about The Sunday Times report on the $7K-a-month cabby, Muhammad Hasnor Hashim. I'm rather surprised this has become such a hot topic. Is it so unbelievable that a taxi driver can earn $7,000 a month? But then there are so many unbelievable things all over the place, including in the newspapers. Why pick on this particular story? It's not as if the cabby is a foreigner because anything about foreigners is a hot topic online, which I've come to accept (although someone did manage to dig up the fact that the reporter, Maria Almenoar, who wrote the story is a foreigner). Sometimes it seems almost random the way people on the Internet will just latch on to a new thing to obsess over week after week and others will follow like lemmings. And I would feel obligated to mention the thing in my Sunday column like a lemming myself because, you know, it "went viral". Anyway, I'm glad I didn't ask my taxi-driver neighbour if he makes $7,000 a month as I don't think I would like it if he asked me the same question. My neighbours and I don't talk to each other very much, but we get along. I just don't want us to end up sending angry letters to each other like a former DJ I can mention.